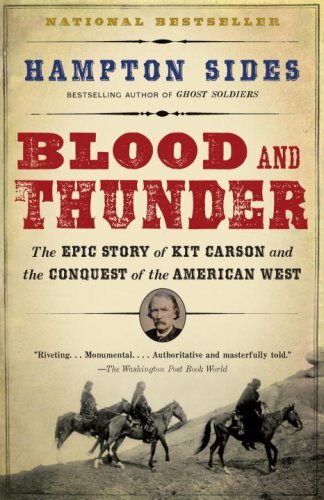 Blood and Thunder: The Epic Story of Kit Carson and the Conquest of the American WestIn the summer of 1846, the Army of the West marched through Santa Fe, en route to invade and occupy the Western territories claimed by Mexico. Fueled by the new ideology of “Manifest Destiny,” this land grab would lead to a decades-long battle between the United States and the Navajos, the fiercely resistant rulers of a huge swath of mountainous desert wilderness. In Blood and Thunder, Hampton Sides gives us a magnificent history of the American conquest of the West. At the center of this sweeping tale is Kit Carson, the trapper, scout, and soldier whose adventures made him a legend. Sides shows us how this illiterate mountain man understood and respected the Western tribes better than any other American, yet willingly followed orders that would ultimately devastate the Navajo nation. Rich in detail and spanning more than three decades, this is an essential addition to our understanding of how the West was really won. Although delivering little in the way of new information, Sides, an Outside magazine editor-at-large and bestselling author (Ghost Soldiers), eloquently paints the landscape and history of the 19th-century Southwest, combining Larry McMurtry's lyricism with the historian's attachment to facts. Inevitably, Sides's main focus is the virtual decimation of the Navajo nation from the 1820s to the late 1860s. Sides depicts the complex role of whites in the subjugation of the Navajos through his portrait of Kit Carson—an illiterate trapper, soldier and scout who knew the Native Americans intimately, married two of them and, without blinking, participated in the Indians' slaughter. Books about Carson have been numerous, but Sides is better than most Carson biographers in setting his exploits against a larger backdrop: the unstoppable idea of manifest destiny. Of course, as counterpoint to the progress of Carson and other whites, Sides details the fierce but doomed defense mounted by the Navajos over long decades. This culminated in their final, desperate "stand" during 1863 at Canyon de Chelly, more than a decade after a contingent of federal troops—operating under a commander whose last name of "Washington" seems ironic in this context—killed their great leader, Narbona. Hampton Sides's Blood and Thunder is more ambitious in its sweep than his acclaimed Ghost Wars (2001), a World War II history. His recounting of harsh frontier life and the violent clashes among the Navajo, the Spanish (Mexican), and the U.S. Army offers a gripping epic while enlivening many of the era's remarkable figures, from soldiers to trappers, farmers, Indians, and pioneer women. Critics especially praised Sides's nuanced discussions of the Navajo and other Native American tribes, as well as his inclusion of maps that chart key routes and conquests. A few critics cited some factual errors, tangential discussions, and omissions of some key historical figures, but overall it's clear that "Sides knows how to tell a good story" (Milwaukee Journal Sentinel).I don't know that much about the Southwest's history during the Mexican-American War and Civil War. But I didn't catch any factual errors or omissions, and the tangential discussions weren't tangential enough to bother me. Blood and Thunder is a blockbuster! With this sweeping and comprehensive history, Hampton Sides vividly and engagingly retells the story of James K. Polk's and the nation's drive to absorb the West and expand America from the Atlantic to the Pacific. Along with this outsized and bold tale of conquest and manifest destiny, Sides generously presents us with a whole constellation of people and events, such as the deliberately provoked (by the U.S.) Mexican-American war, the jarring clash of Native-American and Anglo cultures, the life of the great leader of the Navajos, Narbona, and his awful death, the relentless and brutal efforts of the US Army at eradication of the Navajos and other tribespeople, the coming of the Civil War to New Mexico, and the creation of one of America's first pop heros, Kit Carson. Through newspapers and trashy pulp fiction westerns, known at the time as "blood and thunders," a larger than life western Indian killer and superhero was born, which had nothing whatever to do with the real person. But Americans needed such a hero as Kit Carson to entertain them and to make them feel safe in venturing far away to the west. Sides focuses in on Kit Carson's real life as if it were almost representative of an entire era. The historian Sides is scrupulously even-handed in the telling of this tale and spares us no details, proving that history is often a messy business where sometimes the bad and good intermingle in the same person and event, and one can perhaps never know the whole truth. Nowhere in this work is this more clearly shown than in the person of Christopher Carson, the quiet, unassuming, and illiterate central figure in this drama who had an urge at a young age to take off to parts unknown. He first apprenticed as a trapper and learned from the best of the mountain men, then took the western landscape in as if it were a part of him. He became the most reliable guide and trailblazer known and began to serve the US Army as it sought to tame not only the wild natives but the nation of Mexico as the one-dimensional president, James K. Polk, pursued his obsession of obtaining the West for America. Carson himself, Sides tells us, had a deep abiding respect for the native peoples, married first an Arapaho woman, whom he deeply loved, and, after her sad death, he married a Cheyenne, which quickly proved to be a disaster. On his farmstead in Taos, he coexisted with and accommodated nearby tribes, who knew of and respected him. And he knew and understood the customs of many of the tribes. Yet he also exhibited unbridled violence and murdered countless warriors for what he thought were just causes. Another seeming irony in Carson's life was his being a willing instrument in opening up the West to the rest of the nation, but then sensing, toward the 1850s, that the very settlers he helped were shrinking the once inexhaustible land. They wantonly and stupidly slaughtered the buffalo, were wiping out the silvertip grizzlies, and had brought smallpox and other European diseases to the defenseless tribes, helping to wipe them out as well. Carson, as Sides says, "saw the tendrils of civilization creeping in; the America he had left behind [in the East] was finally catching up with him." This is an extraordinary book, filled with heros and villains, and richly and expertly written. Although Kit Carson's life figures prominently in this work, many other pivotal figures are brought to life to tell this tale. One can never go out West again and feel quite the same about it after reading this work. I urge you not to miss it.I have to agree with all these comments. This is a fine history book. I can't even find much to quibble with. Maybe Sides could've provided more of an aftermath rather than ending abruptly after Carson's death. And maybe he could've explored the antipathy toward Indians a bit more. I don't find it odd that people such as Carson liked some Indians while deeming the race as a whole inferior and unworthy of respect. Isn't that often the attitude of whites toward minorities? Namely, that we love Bill Cosby, Oprah Winfrey, or Michael Jordan but think those other blacks are lazy, good-for-nothing bums. For Indians, that probably describes our attitudes going back to Sacagawea, Squanto, and Pocahontas. We love the "model" members while disliking or distrusting the group as a whole. Anyway, Blood and Thunder is well worth reading. Rob's rating: 8.5 of 10. For more on Kit Carson, see Bosque Redondo = Model for Auschwitz and Kit Carson: Hero or Villain?